I am honored to introduce you to 12-year-old Blogger and Empowering Teen Extraordinaire―Maleeka. Maleeka, of the blog, Meeks Speaks, has a heart of gold and a passion for people. I love what she has to say to teens about standing apart by being unique. 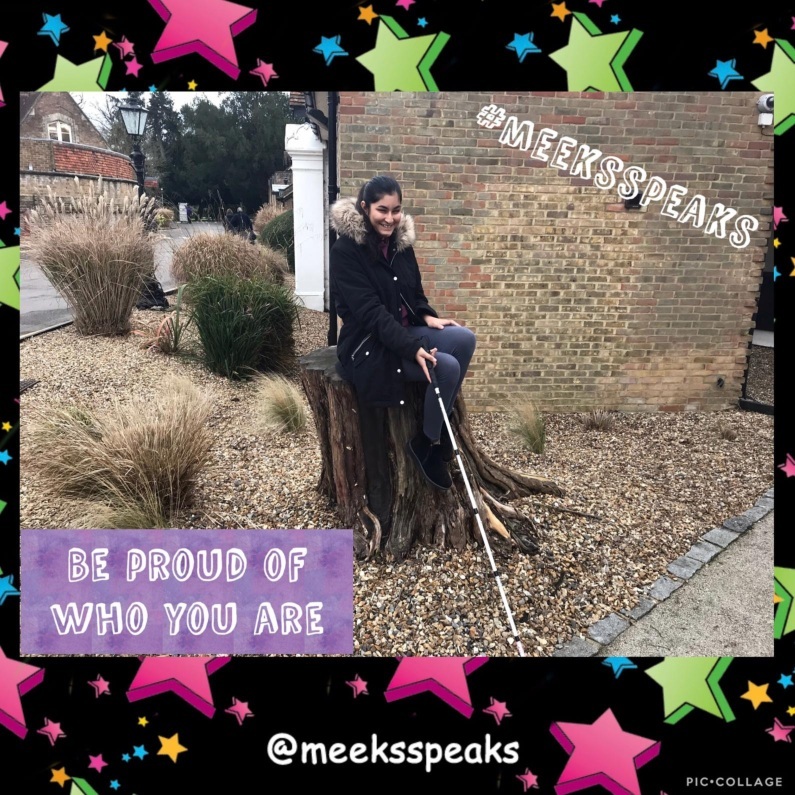 Maleeka, who recently received a letter from Britain’s Prime Minister, Theresa May congratulating her on her work, is going places. I don’t pretend to be someone I am not to be accepted by others. Pretending to be someone you are not to impress others can cause health issues like depression, anxiety, bulimia, and anorexia. It can also make teens feel suicidal when the pressure to keep up with societal expectations are just simply unrealistic. Also, people who do not “act cool” or follow the latest trends can be neglected. This is wrong because they are not appreciated and don’t get a chance to share their unique qualities. By “acting cool”, I mean dressing a certain way or using abusive language. Even bullying and disrespecting others to seem strong or being part of a collective force against a vulnerable person. Some people also don’t stand up for injustice on another as seen as “not cool” by their peers. To me being cool is having a kind heart not about what you look like and treating people with respect. Being cool is being open to different people, their cultures and accepting for who they are. Calm down, try to get away from the noise and have a think. Understand the nature of social media and bring to your awareness that is not your real world. Find out what you are passionate about, what makes you smile, brings joy into your life. Find your unique way of expressing yourself whether through art, music, voice, writer, and comedy. Put your focus on developing your area of interest and be the best you can be in your chosen passion. Don’t take personal what people say or opinions about you. It is more important to be unique and find a special group of friends than to have many and still feel lonely. It’s not cool to be part of a crowd but being unique is cool. Don’t feel pressured to follow the everchanging trends that ruin personalities and confuses identities. It is great to look good and look after yourself but don’t make this your purpose. You will attract the people who will admire you for who you are and be happy in the process of genuine meaningful friendships and interactions with others. As a VIP I love makeup and fashion. Luckily As a VIP, I can’t see what people are wearing or looking like so I don’t judge them for this. It is my hearts eye that “sees.” I am impressed with people who have good hearts and I like to surround myself with people who bring value into my life and I can do the same for them. Helping people find their uniqueness is my big passion behind my blog. To empower young people not to copy others but to be you. There is only one of you just as our fingerprints are all different, we as people are all different too and should be happy to embrace this fact. This way society can grow as you bring unique ideas and creativity to the table rather than same old thoughts and being regurgitated over and over again. This is a photo of the letter and envelope Maleeka received when she was in school. It was during her lunch break when her assistant came up to her and gave me her an interesting looking letter from the House of Commons. It was a letter from Theresa May. Previous post: Worldwide Search For Models With Disabilities! What a very special young lady Steph. She is incredibly wise. Thank you Brigid! Maleeka is an amazing person and I can hardly wait to see what’s in store for her future. A dazzling one for sure. Steph, WOW! This is extraordinary! The next generation is in good hands with leaders like Maleeka. Isn’t she fabulous? Her mom reached out to me several weeks ago and asked if I’d feature her. I wish I had such wisdom at when I was her age.